Many nursing students ask the question “How is an emergency room nurse and a trauma nurse different from one another?” This is a respectable question, and many assume that the two can be used interchangeably. While ER nurses can treat trauma patients in small and mid-sized hospitals, a trauma nurse is a specialist who will only rotate through trauma rooms and assist the trauma team of doctors and lab professionals in a facility. If you would like to learn more about the differences between the duties of an ER nurse and a trauma nurse, read on and learn what you need to know to distinguish between the two. One of the primary differences between an ER nurse and a Trauma Nurse has to do with the condition of the patient being treated. In most hospitals, there is a special department called the Trauma Center, where the patients are sent when they are beyond ill. These patients may have been rushed to the ER because of a car accident, a stab wound, a gun shot, or other serious injuries that require serious medical attention. Patients that are sent to the general Emergency Department are generally coherent. They are in stable condition and able to talk. The ER nurse typically cares for patients who have an illness or sickness, and the Trauma Nurse will work closely with the trauma center to care for patients who are brought in by ambulance and have wounds and serious injuries. Due to unpredictability in each department, working in ER or in Trauma can be stressful and chaotic. If you are working as an Registered Nurse in the Emergency Room, you will be responsible for prioritizing care based on patients who have the highest need. You may also provide IV therapy, dress a minor wound, give injections or work closely with other staff to ensure the patient’s health. 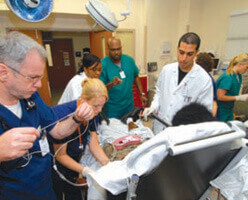 A trauma nurse will work very closely with trauma surgeons. They specialize in emergency treatment and are highly trained to specialize in this type of instrumental care. It is normal for a trauma nurse to work in a critical care unit of an emergency room, and they can also serve an ambulance crew when a new patient arrives to the hospital. Just like an ER nurse, a trauma nurse will assess the seriousness of a patient’s condition so that they can prioritize and save lives. The very first priority of the trauma nurse is to stabilize the patient while they are waiting to be treated. Once the patient is stable, the nurse’s role is much like the role of an ER. nurse. If you choose either job, you must be able to stay calm under high pressure. You will need to be able to deal with a demanding schedule and stay on your toes at all times. If you are interested in working in either department, it is in your best interest to find a preceptor program with a hospital so that you can get experience in the environment, according to the Emergency Nurses Association. When you complete a preceptor program will give you a feel for the title to see if this is what you would like to do. Now that you know the difference between an emergency room nurse and a trauma nurse you can decide which route is best.